The next upcoming Krishna Janmashtami is on Saturday August 24th, 2019. Janmashtami is a Hindu religious festival, celebrating the birthday of Lord Krishna. The date falls in the month of Bhadon on the 8th day of the dark fortnight in the Hindu calendar which is July, August, or September. 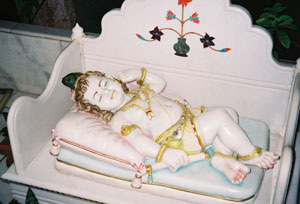 People in India celebrate this day with song, dance, and cradle rocking the baby Sri Krishna. Homes and temples are decorated and illuminated in the areas where Sri Krishna's life was spent- Mathura and Vrindavan.